Nijo Castle (二条 城, Nijōjō), built in 1603, served as the residence of Tokugawa Ieyasu, the first shogun of the Edo period (1603-1867.). 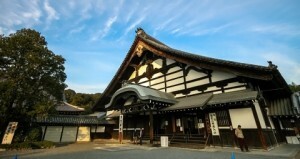 His grandson, Iemitsu, in techenii20 years has expanded the boundaries of the castle. Once in 1867, it was the end of the Tokugawa shogunate, Nijo Castle some time was the Imperial Palace, and was later donated to the city as a historically significant landmark, open to the public. 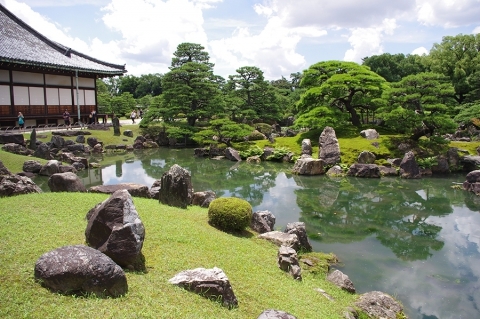 It is believed that the Nijo Castle – the best preserved examples of the architecture of feudal Japan. In 1994, the fortress became a UNESCO World Heritage Site. Nijo can be conditionally divided into three parts: Nonmaru (main defensive line), Ninomaru (second line of defense), and the third part – it’s gardens surround the defenses. The whole complex is surrounded by walls and moats. Visitors enter the territory of the castle through the great east gate. 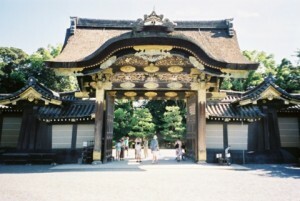 The road from here will take you to the gates of Caramon made ​​in the Chinese style – this is the entrance to the Ninomaru, where the eponymous palace is located. Ninomaru Palace – was the main residence of the shogun during his stay in Kyoto. To this day Ninomaru preserved in its original form: the palace consists of several buildings, joined together by long corridors. The main feature of these binders passes – the so-called “singing floors” that are beginning to creak melodiously once to have someone coming. This was a safety measure – against the penetration of strangers. The floors in the rooms are lined with tatami mats, walls and ceilings are different rich finish, and traditional sliding door delicately painted. During the tour, visitors pass along a variety of rooms and audience expectations. 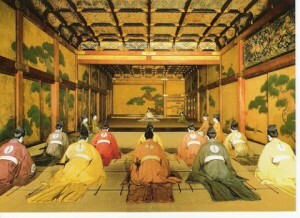 Once, in the main hall of audience allowed only high-ranking guests – there they were met by the shogun himself, sat on a small dais surrounded by guards, hidden behind a secret door. Less titled visitors are not met Shogun personally – their withdrawn in the next room, where they could only see the silhouette of the ruler. The interiors served as the private quarters of the shogun and his wives. Outside the palace Ninomaru extends a traditional Japanese garden with a large pond, decorative stones and pine trees. On the territory of Honmaru (main defensive line) once housed the second palace complex, as well as the five-story tower. But both buildings were completely destroyed in a fire in the XVIII century. The castle has an excellent cherry orchard – during cherry blossom here attracts people from all over the country to enjoy the beauty of Japanese cherry. flowering season in Nijo much longer than anywhere else in Japan, as in the castle collected a large number of species of cherry. So that you can come here for the whole of April. Also at the end of February in the gardens of the famous Nijo Japanese plum blossoms. Some parts of the garden are lined with trees ginkgo and maple, which can be seen in all its glory during the Momiji-gari (the second half of November). Entrance to the Nijo Castle is within walking distance from the station Nijojo-mae subway Tozai line. From the station Kyoto, you can get on the Karasuma subway line to the station, Karasuma-Oike, transfer to Tozai line and go to the station Nijojo-mae. All oezdka takes about 20 minutes, the cost – 260 yen. On Tuesdays in January, July. August and December (or Wednesday if Tuesday – a national holiday); from 26 December to 4 January. In stock, rental 500 yen.